"I am delighted that Pilot are part of this ambitious and exciting new work as part of the cultural offer around the world’s greatest cycle race and is particularly looking forward to hearing the commissioned work in some of England’s most spectacular settings!" Mandy has worked at Pilot Theatre since the beginning of 2000 during which time the Company has produced over 35 plays, from national tours to site specific productions such as the recent highly acclaimed Blood + Chocolate in York. 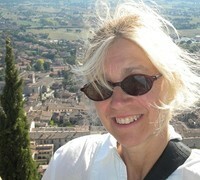 She has particular responsibility for Pilot’s European and Engagement work - acting as consultant on the recent and current Europe Culture projects Pilot has been involved with including their current work with companies in Italy, Portugal, Canada and Australia on Boomerang, Documents of Poverty and Hope.